Meat extract is a potent and rich form of meat stock, usually made from bovine and is a highly concentrated meat stock. It is used to add meat flavor in cooking, and to make broth for soups and other liquid-based foods. It is broadly utilized as a part of different purposes- prepared under high hygienic conditions. 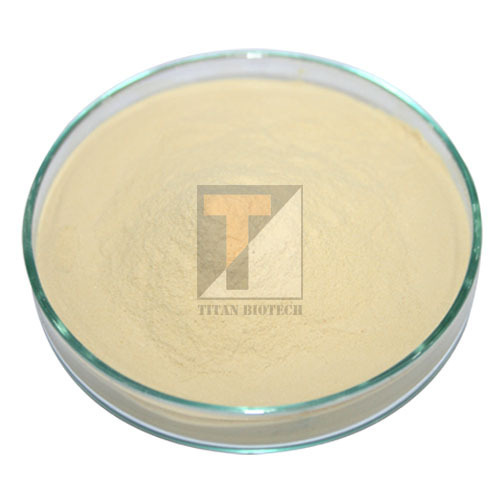 Our offered Meat Extract Powder is effortlessly solvent in water and structures an unmistakable yellow arrangement. Titan biotech is one of the largest manufacturer of good quality of meat extract powder prepared under high hygienic process around the world. It is undoubtedly highly nutritious and beneficial product used in preparing microbiological culture media. Meat Extract has wide range of applications such as stuffing, nuggets, stock powder, bouillon cubes, seasoning, coatings, soup powders, sauces, soups, ready meals and snacks. Meat Extract Powder is prepared and standardized for use in microbiological culture media, where it is generally used to replace infusion of meat. Meat Extract Powder which contains culture media is recommended for use in bacteriological examination of water, milk, and other materials, where uniform composition of media is important. Meat Extract Powder is relied upon for biochemical studies, particularly fermentation reactions because of its independence from fermentable substances. There are several media containing meat Extract Powder are recommended in standard methods for multiple application. MEAT EXTRACT POWDER is prepared by controlled enzymatic digestion of good quality meat and is very useful for preparations of culture media in the laboratory as well as in Industrial fermentations. Meat Extract is highly concentrated meatstock, usually made from beef. STORAGE: Hygroscopic by nature, store the material below 25 ºC, protect from direct sunlight. Meat extract powder is a raw material that helps in growing microorganisms artificially, mainly for bacterial culture and fermentation. The meat Extract Powder is widely used in the preparation of biopharmaceutical fermentation and various media. Manufacturer of meat Extract Powder for Microbiology made this product from fresh meat by autolysis, hydrolysis, separation, concentration and other modern high-tech biological refined soluble paste products. Meat extract is rich in creatine, creatinine, polypeptides, water-soluble substances amino acids, nucleotides, organic acids, minerals and vitamins class. Wherein meat extract provides carbon and energy source for the microorganisms, phosphate, peptone provide the main nitrogen source, inorganic salts and NaCl provided. In the preparation of the solid agar medium but also a certain amount of coagulant added. Because of this basic culture medium containing nutrients required for bacterial growth and reproduction in general, it is available for microbial growth and reproduction purposes. Refined for use in microbial culture media. Characteristic odor but not putrescent. Meat Extracts can be in many applications such as stuffing, nuggets, stock powder, bouillon cubes, seasoning, coatings, soup powders, sauces, soups, ready meals and snacks. Used to make broth for soups and other liquid-based foods. Used to add nutrition value to the food. Nutritive ingredient in many cultural media.